At our monthly Malibu Lagoon walk on Feb. 26, many participants noticed that there seemed to be an unusual number of dead birds on the beach. I saw at least a half dozen Cormorants and one Coot. 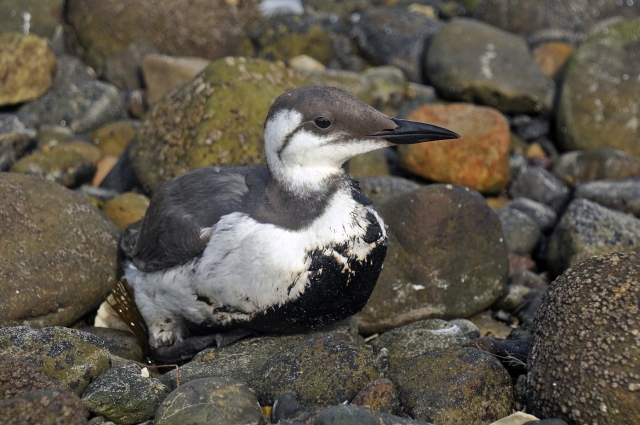 On Feb. 15 chapter member Jim Kenney photographed this Common Murre with a large oil patch on its belly, sitting on the beach cobbles. Generally speaking, seabirds such as Loons, Grebes or any of the Alcids such as Common Murre, really don’t like to come to land – especially if humans are present – except when breeding. If you see one sitting on the beach, there’s probably something wrong with it: oiled, sick or wounded in some way. If you help it, it may survive. The oil-caused seabird mortality has now hit the local newspapers. According to the LA Times, seepage from the seafloor in the Santa Barbara Channel near Coal Oil Point amounts to thousands of gallons a day. For unknown reasons, Common Murres have been more abundant off Southern California during the past three winters than they were in previous years, and thus more oiled Murres are showing up at rescue stations. They’ve been appearing SoCal beaches as far south as Orange County, oiled, dying or dead. International Bird Rescue in San Pedro has treated over 140 birds of various species since Jan. 1, including at least 124 Common Murres. And in case you missed it, here’s the earlier LA Times story on the albatross which showed up back in January. We now have a permanent Bird Rescue page on our blog. The following organizations are non-profit, need donations and frequently solicit volunteers. In the Malibu area, CWC is the closest place to call. I work with Project Wildlife in San Diego and we are also seeing these birds, so it is farther south than Orange County! We have sent over 20 Murres to Sea World for treatment since Mid-February. Hello, I am the Executive Director of California Wildlife Center, a wildlife rescue and rehabilitation facility located in the city of Calabasas. We are also an active member of the Oiled Wildlife Care Network and have been working closely with International Bird Rescue (IBR) to help care for the many birds showing up recently on our beaches. If you encounter an oiled bird in the city of Malibu, please contact our Animal Care Hospital at (818)591-9453 or our Rescue Team at (310)458-9453. In many cases, we will be able to send a Team out to collect the bird. Of course, if you are able, oiled birds can be brought directly to our facility for immediate treatment and stabilization. For more information, you can visit our website http://www.cawildlife.org. Thanks everyone for helping out the birds anyway you can!